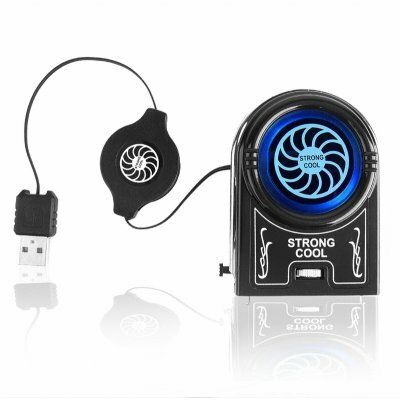 Successfully Added Mini Notebook Cooler - Clip On Air Extracting Fan to your Shopping Cart. Mini portable notebook/ laptop cooler, with a unique clip on design and an air extracting fan for pulling the hot air out of your laptop and expanding its life span. Large load bearing laptop coolers are a very nice accessory for any owner of a portable notebook, but people pressed for space when they travel will find this a God sent mini notebook accessory. Easily fitting any laptop with the normal straight or 45 deg tilted design, this small hot air extractor is powered directly via the USB. Rather than spending thousands for a new laptop computer because it overheated, buy this super low wholesale priced mini notepad cooling system.